It’s summertime, hopefully the weather is playing ball. But whether (pun intended!) it is or not – summertime still means one thing… Get the BBQ out – even if you have to stand under a brolly, while the food is sizzling! 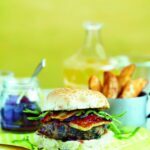 Or, I can let you into a secret for this recipe… it’s a burger with the taste and flair of a great BBQ – but it is cooked indoors – to be eaten outside if the weather is peachy! Handful of fresh chopped mint this is optional - but really adds a zing, so well worth adding! Heat half of the oil in a pan and cook the onion for around 5 minutes - until softened. Next add the garlic chilli flakes, and the ground coriander - cook for a few more minutes. Put into a bowl to cool for a few minutes. Add the lamb and mint (if using) to the onion mixture in the bowl, mix well, and then divide into four equal portions and shape into burgers. Heat the remaining oil in the pan, and fry the burgers for around 5 minutes on each side (in batches if your pan is not big enough). Fry until golden and cooked through. Fry the halloumi for about a minute on each side until golden. 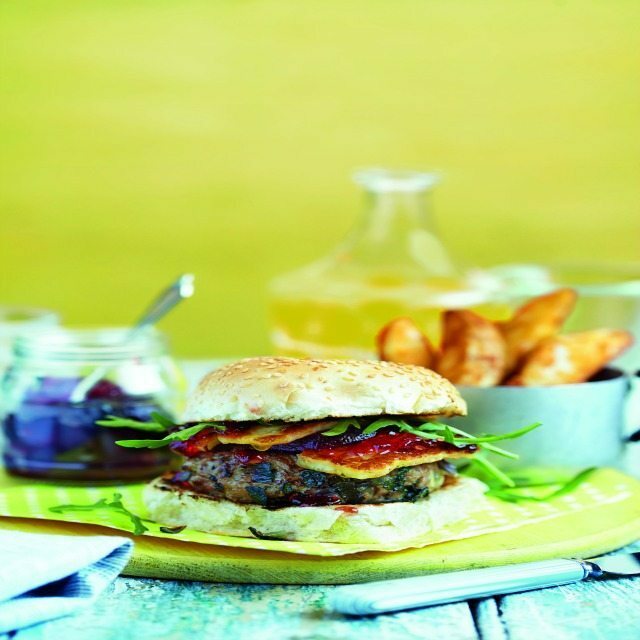 Serve in the sesame bun with the burgers and beetroot slices. Top with rocket and redcurrant jelly. A great accompaniment would be potato wedges. Don't forget to allow extra time for cooling the fried onion mixture! Please also feel free to check out our great Pinterest Board. There are loads of great recipes you will enjoy here.